A sauce is the crowning glory of any dish. From the basic "five mother sauces", there are literally hundreds of variations of sauces that are used to dress, complement, enhance and bring out the flavor of the food it is served with. So what are the five mother sauces? There seems to be a slight difference of opinion as to what the actual five mother sauces are, which in the final analysis are truly dependent upon which ones are used in today's cooking. According to the ultimate cooking reference book, The New Food Lover's Companion, by Sharon Tyler Herbst, the French are credited with refining the sophisticated art of sauce-making. The development of various sauces over the years stems from the 19th-century French chef Antonin Carême who evolved an intricate methodology by which hundreds of sauces were classified under one of five "mother sauces." Those basic sauces are the white sauce Béchamel, the light stock-based Velouté, the brown stock-based Espagnole; Allemande, based on stock with egg yolk with a hint of lemon juice (20th century French chef Auguste Escoffier updated the classification replacing sauce Allemande with the egg-based emulsions, Hollandaise and Mayonnaise); and the oil and vinegar-based Vinaigrette. Chef Escoffier also added Tomato Sauce to his updated classification of the mother sauces, however, it actually came about later...although it certainly has earned the title since it is the base for a large variety of sauces in today's cookery. The method for preparing the various types of sauces incorporates some of the same techniques. 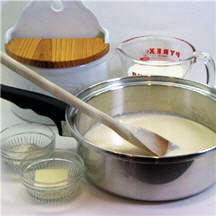 For example, a roux is basic to many of the white and brown sauces. This cooked mixture of flour and fat (usually butter) is an important contribution to the sauce-making art. In addition, these classic sauces have been joined by a plethora of modern-day sauces such as sweet dessert sauces, tomato, pesto and barbecue sauces, as well as a wide variety of gravies. Always remember that when a sauce is used on a food, it is the first thing to touch the tongue. A sauce is only as good as the ingredients you put into it and the care you take while preparing it. On the other hand, a good sauce does little to make inferior food taste better. Always put a good sauce on good food. Thankfully, we no longer use sauce to mask "off-tasting food" as was once the practice in times before modern refrigeration! Béchamel, the classic white sauce, was named after its inventor, Louis XIV's steward Louis de Béchamel. The king of all sauces, it is often referred to as a cream sauce because of its appearance and is probably used most frequently in all types of dishes. Made by stirring milk into a butter-flour roux, the thickness of the sauce depends on the proportion of flour and butter to milk. The proportions for a thin sauce would be 1 tablespoon each of butter and flour per 1 cup of milk; a medium sauce would use 2 tablespoons each of butter and flour; a thick sauce, 3 tablespoons each. Velouté is a stock-based white sauce. It can be made from chicken, veal or fish stock. Enrichments such as egg yolks or cream are sometimes also added. Espagnole, or brown sauce, is traditionally made of a rich meat stock, a mirepoix of browned vegetables (most often a mixture of diced onion, carrots and celery), a nicely browned roux, herbs and sometimes tomato paste. Hollandaise and Mayonnaise are two sauces that are made with an emulsion of egg yolks and fat. Hollandaise is made with butter, egg yolks and lemon juice, usually in a double boiler to prevent overheating, and served warm. It is generally used to embellish vegetables, fish and egg dishes, such as the classic Eggs Benedict. Mayonnaise is a thick, creamy dressing that's an emulsion of vegetable oil, egg yolks, lemon juice or vinegar and seasonings. It is widely used as a spread, a dressing and as a sauce. It's also used as the base for such mixtures as Tartar Sauce, Thousand Island Dressing, Aïoli, and Remoulade. Vinaigrette is a sauce made of a simple blend of oil, vinegar, salt and pepper (usually 3 parts oil to 1 part vinegar). More elaborate variations can include any combination of spices, herbs, shallots, onions, mustard, etc. It is generally used to dress salad greens and other cold vegetable, meat or fish dishes. Constantly stir roux-thickened sauces while cooking to prevent lumps. If you must leave the sauce for a few seconds, set the pan off the heat during that time. If a roux-thickened sauce develops a few lumps, beat them out with a rotary beater or wire whisk. As a last resort, strain sauce with sieve to remove lumps. Cook egg-thickened sauces over low heat, or cook these sauces in the top of a double boiler over hot, not boiling, water. Always temper (warm) the egg yolks before adding them to the sauce by first stirring in a little of the hot sauce mixture into them. Then add to the remainder of the sauce mixture. Never let a sauce boil after the egg yolks are added as the sauce may curdle. Don't let water boil in the bottom of the double boiler if you use it to make egg-thickened sauces. Also, be sure that the water doesn't touch the bottom of the pan holding the sauce. Article by Hope Pryor. Copyright © 2002 Hope Pryor; property of CooksRecipes.com. Article revised October 2007. Reproduction in whole or in part without permission is prohibited.